Over the last few days, the Cassini Saturn orbiter's raw images website has been bursting with awesome pictures. 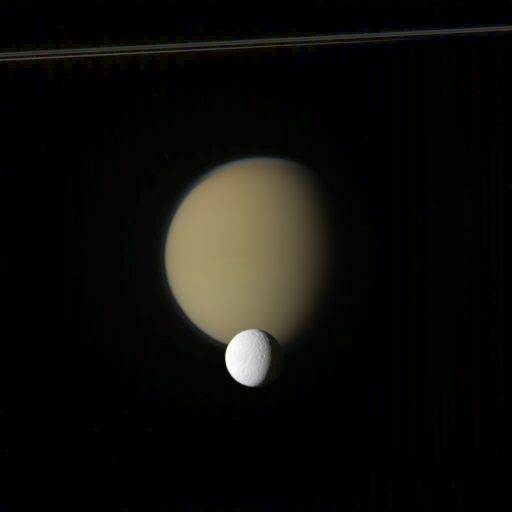 In the past week, Cassini passed reasonably close to, and imaged, Titan, Mimas, Pallene, Dione, and Rhea. (Pallene is a tiny moon located between the orbits of Mimas and Enceladus). Here, just for fun, is an animation of five wide-angle photos of Rhea. Cassini captured these five images of Rhea during a relatively close encounter (within 40,000 kilometers at closest approach) on October 17, 2010. The images were captured with its wide-angle camera, which has a field of view ten times broader than its companion narrow-angle camera. The biggest visible impact basin is Tirawa. I don't post wide-angle photos of moons very often because most of Cassini's images of the icy moons are taken from far enough away that the moon doesn't fill Cassini's narrow-angle camera field of view. The wide-angle camera has a field of view ten times wider than the narrow-angle camera; I use wide-angle views of Saturn a lot, and sometimes Titan, but usually the other moons are just a speck within its frame. But Cassini got close enough to Rhea, and Rhea is big enough (Saturn's second largest moon at 1,538 kilometers across) that it filled the wide-angle field of view nicely as Cassini swept slowly past. There's an even cooler set of images that appeared on the website earlier today. They show that Cassini doesn't need to be close to the moons to take spectacular photos. We're seeing Tethys -- and its iconic Ithaca Chasma snaking across its surface -- poised in front of Titan, with the entire ring system foreshortened almost into nonexistence in the background. The perspective is a bit of an optical illusion. Even though Tethys and Titan look very close to each other, they're not. Tethys orbits closer to Saturn than Titan does. So for Tethys to appear in front of Saturn to Cassini, Titan needs to be on the opposite side of Saturn from Cassini in its orbit. I fiddled with the Solar System Simulator a bit to figure out the time of this observation, and you can see that at 15:00 on October 18 Titan was about 2.5 million kilometers away from Cassini (confirming the numbers quoted on the raw images website) while Tethys was 40% closer at 1.5 million kilometers away. Being 40% closer also exaggerates Tethys' size relative to Titan, making it appear almost half again larger than its true relative size. Titan is a big moon! Anyway, getting back to the Titan images: at the same time that those other images were taken, Cassini also took one with a special filter, one that only permits certain infrared wavelengths (near 938 nanometers) to pass through to its detector. At this particular wavelength, methane gas -- an important component of Titan's atmosphere that is opaque in visible wavelengths of light -- is unusually transparent. When viewed through this filter, here's what Titan looked like. What's so exciting about this photo? Here's an enhanced version, created by dividing the image above by the blue-filter photo. This cancels out some of the blurring due to the atmosphere, making certain features clearer, namely an enormous band of clouds crossing the equatorial regions. There's also some clouds in the mid-southern latitudes, and some at the north pole. 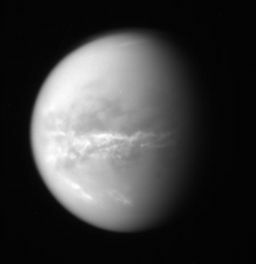 An enhanced view of Titan's cloud bands on October 17, 2010. 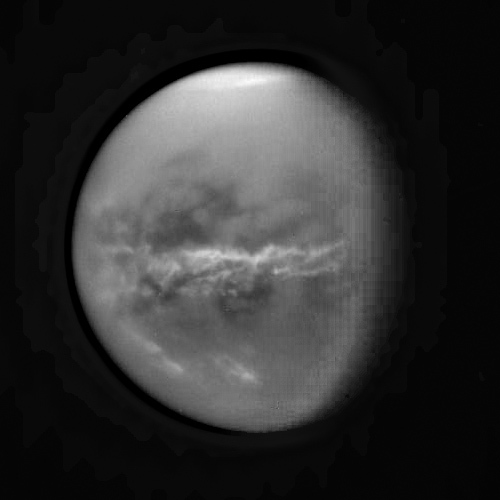 This image is the ratio of two images taken through methane window and blue filters, which cancels out some of the blurring effect of the atmosphere and reveals surface features (which appear dark) as well as a huge equatorial band of clouds (which appear bright). It also enhances the north polar hood and reveals some clouds in the mid-southern latitudes. For a very different take on this image sequence, visit Lights in the Dark.